The winners of the Royal Television Society Northern Ireland (RTS NI) 2017 Programme Awards were announced at a glittering awards ceremony in The MAC Belfast last week, hosted by TV presenter Angela Scanlon with guest presenter Michael Smiley. The big winners were Stellify Media which won the Comedy and Entertainment Award for Beauty Queen and Single and the Factual Entertainment Award for In Solitary. Holywood Producer Mark Huffam was announced as the winner of the RTS NI Judges Award in recognition of his outstanding contribution to local television and film production. Huffam who was born in Antrim, has produced a number of television shows and films including Saving Private Ryan, Mamma Mia and the first series of Game of Thrones. Unfortunately, although Huffam planned to attend the Awards in person, he had to send a video message as he was called back to film Christopher Plummer’s new scenes for the upcoming Ridley Scott thriller ‘All the Money in the World’. 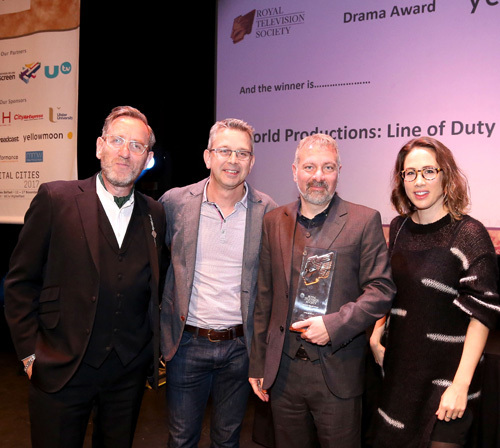 Line of Duty filmed in Belfast by World Productions took the award for Best Drama and Sixteen South won the new Original Score Award for The Salty Chicken. BBC Northern Ireland picked up two awards for Current Affairs and News both relating to its coverage of the RHI Scandal for Spotlight: Burn to Earn and A Nolan Show Investigation. Crossing the Line’s Wild Ireland took the Specialist Factual Award and Tern Television and Borough Productions’ The Good Terrorist won Best Documentary. The Interactive Entertainment Award went to Big Motive for Tara’s Locket – A VR Story for Children and the award for Children’s / Animation went to Zodiak Kids Studios UK for Secret Life of Boys. 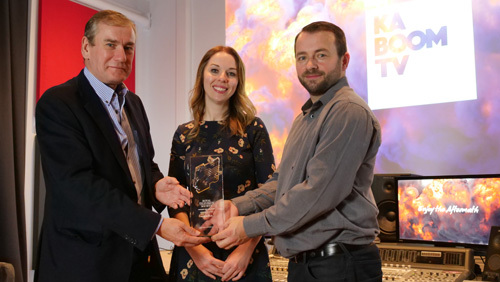 The RTS NI Programme Awards 2017 are delivered in partnership with BBC Northern Ireland, Northern Ireland Screen, Channel 4 and UTV, along with the headline sponsor this year Ka-Boom. “Congratulations to all our winners who represent the best of the exceptional talent coming out of Northern Ireland in recent years.